The Long Living Chair is a rocking chair with enhanced memory. It knows the day it was produced and can record how many times is used for about 100 years. Its semi-hidden display and the slow pace at which it changes suggest that the recorded information should not be accessed frequently. Instead, it is meant to be forgotten, and accessed only once in a while, when owners are able to reflect on the way the displayed information relates to their long-term practices. The project was developed as a reflection on Slow Technology. 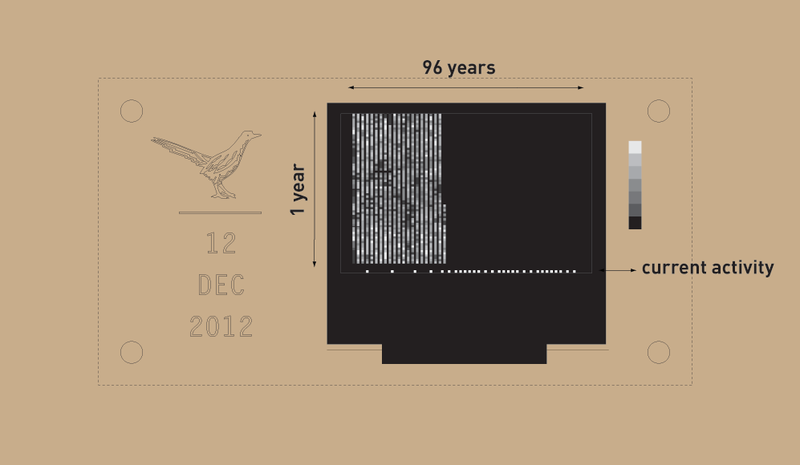 The Long Living Chair is an attempt to prolong the lifespan of an object by providing it with a dedicated digital memory. The memory records every time the chair is rocked and this data is displayed back to users in a subtle manner. The aim is to allow people to project their behaviours on the object, and to later recall moments shared with it. 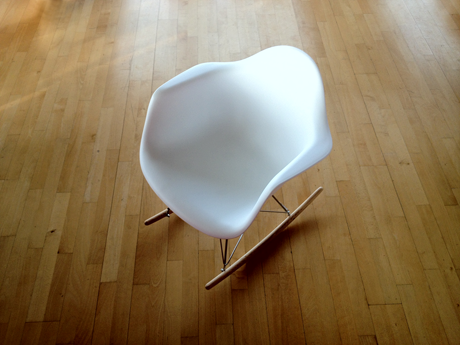 cation could press people to use the chair more often, turning it into a fast artefact. To avoid this, we kept the display out of sight of the person sitting on the chair, and slowed down the change of the displayed information to an almost invisible level. Another important aspect of the project is the focus on a single function. The digital information here is not intended to provide the object with new functions and is only there to support its main reason of existence. The current demonstrator of the Long Living Chair consists of an augmentation of the iconic RAR rocking chair designed by Charles and Ray Eames. The choice was motivated by the widespread recognition of the Eames chair as a high quality and desirable object. 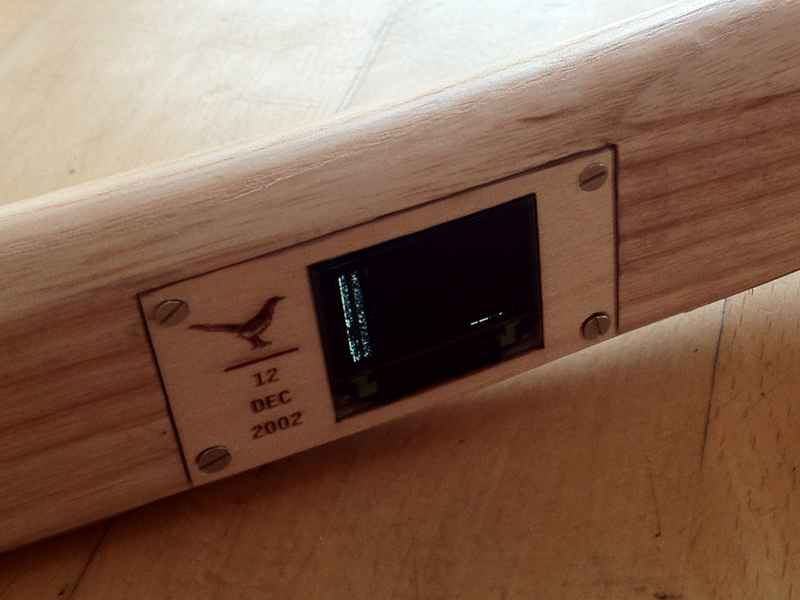 In the prototype, one of the chair rails has been carved and embedded with a motion sensor and a small display. The display is divided in two main areas. The top area contains the graph that represents interactions in the long term. In this graph each pixel represents a time span of 146 hours (approx. 6 days). Activity is represented by the brightness of each pixel: the brighter the pixel, the more the chair has been rocked in the respective period. Pixels are chronologically organised from the bottom to the top and from the left to the right. Each column represents one year. Since the display contains 96 columns, it also suggests that the chair should be preserved for the same amount of years. 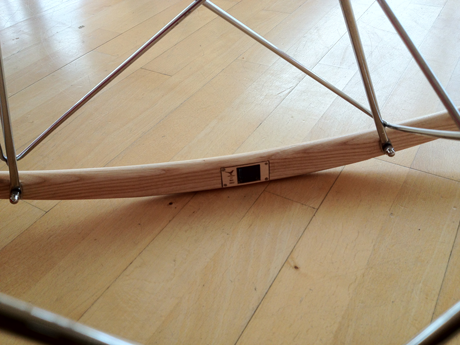 The time represented begins when the chair was produced, or more specifically at the moment the display has been embedded in the chair, and ends at the present time. Once the 96 columns are full, the memory is automatically reset. The second area of the display, located at the bottom of the main graph, is used to signalise movement. In this area pixels move horizontally from the right to the left, crossing the display at 1 step per second. In this way, each pixel represents one second of activity and the entire display is turned off when the chair is left to rest for 96 seconds. The display was strategically positioned in the inner side of the chair right rail. Due to the slow pace in which its information changes, forgetting its existence actually helps users to notice the change. As with the physical wear of artefacts, minimal incremental changes become invisible in the everyday, and can be better recognised after a period without seeing the object. The idea is that the display would only be accessed in life-changing moments, when the chair needs to be moved or repositioned. This might be a period when a family needs to move house or the space needs to be rearranged to support a new activity or the arrival of a new member. On theses moments dwellers would be able to recognise periods of high and low activity or even wonder about patterns left by previous owners. The semi-hidden position of the display also mimics the marks artisans traditionally leave on their produced artefacts. The date of production, as well as a pictorial personal symbol have been represented on the chair to reinforce this resemblance. Encouraging keeping objects for longer, promoting slow interactions, the focus on a single function and the emphasis on the quality of crafts are important concepts related to slow technology that the Long Living Chair aims to embody.